Asthma is a respiratory disease that affects the movement of air in and out of the lungs. It is a chronic condition and is an autoimmune disease. There is inflammation of the air passages. Small tubes are present in the lungs called as bronchi that become inflamed. When a person suffering from asthma comes in contact with an allergen that triggers the attacks there is narrowing of the respiratory tubes which lead to an increased production of the sticky mucus. People suffering from asthma have to take nebulizers for getting rid of acute asthmatic attacks. Sometimes nebulizers fail to provide relief and it becomes an emergency and the patient has to be admitted in an emergency. Some people also try herbal remedies for asthma which are very effective and quickly give relief from asthmatic attacks and prevent recurrence of symptoms of asthma attack. Some people also take a home remedy for asthma. There are different home remedies which are discussed below in this article that help people to avoid asthmatic attacks and symptoms of asthma attack. People suffering from asthma have productive cough. There is production of mucus from the respiratory passages when the tubes get blocked. Cough produces a typical wheezing sound in patients suffering from asthma. Cough is aggravated in the morning or at night. There is tight feeling in the chest and patient feels as if a tight band is wrapped around the chest. Asthmatic patient has to gasp for breath. There is a feeling of breathlessness. 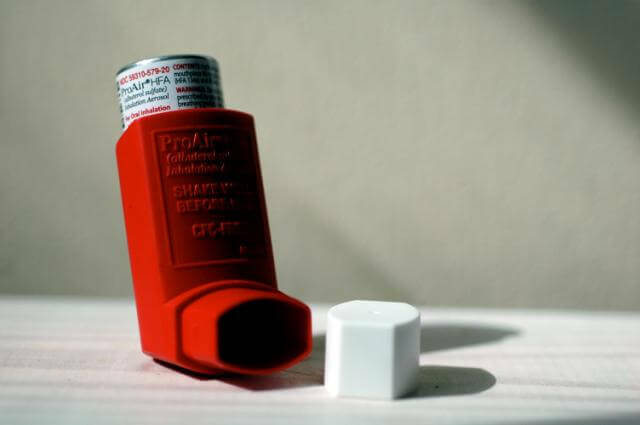 Asthmatic attack may be triggered by an exposure to the allergen, stress or loss of sleep. Low immunity is another cause for a severe asthmatic attack. Patient feels weak and tired after an asthmatic attack and wants to lie down. Sometimes there is fever due to infection of the bronchi. Patient may have pain in the chest due to continuous wheezing and coughing. During an asthma attack patient feels agitated and restless. There is high pulse rate and breathing is very fast. Asthmatic patients have to avoid pollens, dust and other factors that may trigger the asthma attacks. They should use air condition in cars and homes to avoid exposure to pollens and dust. People with asthma should remain away from carpets, old draperies, books, toys that have dust on them. Turmeric is a very good home remedy for asthmatic attacks. Take a warm glass of milk and add half table spoon of turmeric in it to avoid asthmatic frequent attacks. Take 5 to 6 cloves and boil in half glass of water. Add one tea spoon of honey. Drink this mixture two times in a day. It is an excellent decongestant and helps to remove mucus from the chest. Take half glass of water and add one teaspoon of honey, pinch of ginger powder and a pinch of black pepper. Boil all the ingredients together to form a decoction. Take it two times in a day to get relief from asthma. Take dried grapes and put them in water. Then put them in cold milk and eat empty stomach in the morning to avoid asthmatic attacks. Five to six cloves boiled in half a glass of water with a spoon full of honey serve as an excellent decoction against asthma; if taken twice a day. Dried figs also help to eliminate mucus from the respiratory tract. Prepare an herbal tea using ginger juice and lemon juice. Drinking of herbal tea two times in a day is extremely useful for asthmatic patients. Take a glass of warm milk and now add equal amounts of honey and olive oil to it. Drink this milk every day before breakfast in the morning to prevent the attacks of asthma. Take some fenugreek seeds and soak them in warm water. Add one tea spoon of ginger juice to the boiled water. It serves as one of the best remedies for the treatment of asthmatic symptoms. Basil is an important herb used for the treatment of asthma. Prepare a tea by boiling some basil leaves and takes it steam to get relief from congestion in the chest. Drumstick leaves can be boiled and a decoction may be prepared by adding lemon juice and ginger juice. Take this effective home remedy for the natural treatment of asthma. Divya Swasari Ras: It is an excellent herbal remedy for asthma attacks. People suffering from asthma may take this herb regularly to boost up the immunity and prevent recurrent attacks of asthma. Divya Sitopladi churna: This herbal remedy is very important for chronic cough. It helps to give relief from chronic cough and continuous wheezing that occurs in asthmatic patients. It helps to eliminate the accumulated mucus from the lungs. 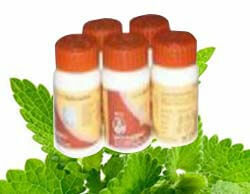 Divya Abhrak Bhasm: This is a wonderful product prepared from the herbs for the treatment of recurrent asthma attacks. This natural bhasm gives quick relief from cough and mucus produced in asthmatic patients. Divya Praval Pisti: This is a natural solution for asthma and it may be taken regularly to boost up the immune system of the asthmatic patient and to relive the congestion in the chest. Divya Trikatu Churna: This natural herbal remedy for asthma helps to relieve the congestion in the chest and prevents formation of mucus. It increases the strength of the bronchi to give relief from symptoms of asthma. Divya Lakshmi Vilasa Ras: This herb is a natural product for the treatment of respiratory infection. People suffering from asthma may take this herb for reducing the inflammation of the bronchi and for reducing the production of mucus. Divya Sanjivini vati: This is one of the traditional herbal remedy for the treatment of any kind of respiratory disease. It is time tested remedy for the treatment of asthma and other respiratory infections.